Adobe Illustrator is by far the best program for creating vector artwork, especially when it comes to creating complex shapes. We use Illustrator‘s set of Pathfinder tools. We show you how to utilize these to their fullest extent in all of our Adobe training courses. To create the complex shapes shown here we first have to create a new document in Illustrator, via the top left File menu. Then we open the panel via Window > Pathfinder, which opens a few stacked panels. 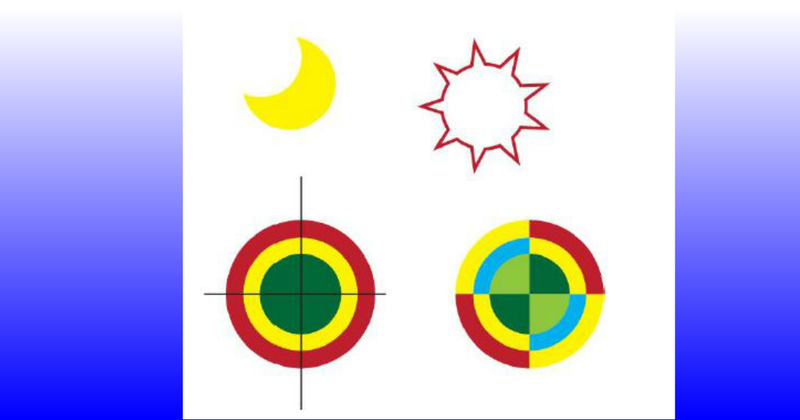 First we’ll create the yellow moon shape shown here on the right. Use the Ellipse tool to make two circles – remember to press the Shift key on your keyboard to keep the width and height proportionate (ie. to create a perfect circle). Use the Move tool to overlap the two circles. Select both circles with the Selection tool, then click the Minus Front icon (the second icon) to subtract the second circle. This is a complex shape, but you can still manipulate the original circles using the Direct Selection tool. 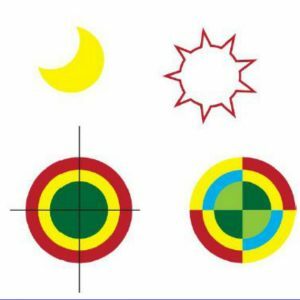 To create the starburst sun shape on the far right we first create a circle as before. Then we press down on the basic shapes tool set to reveal the Star tool at the bottom. By default this will create a 5-pointed star, but we can change the number of points by either clicking once on the art-board to open the Star tool dialog box. Or alternatively we can click the up and down arrow keys on your keyboard as we drag out the star shape. The size of either circle or star can be changed by dragging with the Selection tool whilst pressing the Shift key to keep the shape proportionate. Next we align the two shapes by selecting both with the Selection tool and clicking on the Align panel tab, and selecting the Horizontal and Vertical Align icons. To create the complex shape we go back to the Pathfinder panel and click the Unite icon (the first icon in the set). To give the full effect of the complex shape we will change the fill and stroke settings – in this example we chose a red stroke and a white fill. This can be done in either the Swatches panel, the Colour panel or in the Colour Picker dialog box. To create the segmented circles of the bottom right image, first we create three concentric ellipses. Then we add horizontal and vertical lines using the Line tool and also pressing the Shift key to keep them constrained. Next select all 5 shapes using the Selection tool, and go to the Pathfinder panel once again. This time select the Divide icon (the bottom left icon). We can now select each segment individually using the Direct Selection tool, in order to change its fill or stroke colour. Whether you’re a complete beginner or self-taught, our training courses will help you gain self-confidence in your Illustrator workflow, as well as adding to your professional skill-set.